A Ganesh Nadar tracks down four Mumbai police officers who confronted the terrorists on 26/11, but whose bravery that night has gone unnoticed or unrewarded. The four terrorists had gone into the Taj Mahal hotel on November 26. 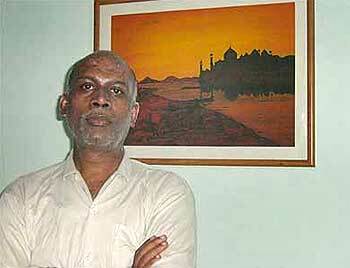 Inspector Deepak Dhole and eight others followed the murderers into the Taj. "I did not wait for an order to go in," Dhole recalls, "I was not thinking of a medal when I went in. I went in because the Taj is in my area. I am an inspector at the Colaba police station. It was my duty to go in." He was at the Taj along with his colleagues for four hours -- the longest four hours in his 23-year career in the police force. He saw colleagues being injured and colleagues being killed. He did not flee the bullets or the grenades. Finally, he left the Taj when the terrorists set the area close to where he was stationed on fire. He created a temporary path through the firewall to escape. Seven of his colleagues followed him through the fire and are alive today because of this act of courage. Dhole was confined to his home for three months because the skin on his face had peeled away in the fire. The doctors have told him to stay out of the sun for a year. "I am in charge of the Colaba police station now, how can I follow such orders? But I try to remain out of the sun as far as possible," he says. Inspector Deepak Dhole has not received any award, any citation or cash prize from the government. The police officers and men at the Marine Drive police station rushed to the Oberoi hotel when they heard about gunfire there. Inspector Kishorekumar Shinde saw a dirty plastic bag near the hotel's door. Certainly out of place in a five-star hotel doorway, he thought. He picked the bag up. "It must have weighed 12 kgs. The weight was the give away. I knew it was RDX," Shinde recalls. "Instinctively, I moved it away to a secluded place some distance away. The bomb disposal squad arrived almost immediately. A sniffer dog confirmed the explosive nature of the bag." "We put riot shields around the bag. It exploded the next minute sending the shields flying 70 metres away." For that act of courage Inspector Kishorekumar Shinde has not received any award, any citation or cash prize from the government. "Even those who stayed at home that day are getting a salary," he says. "I too am getting a salary. They gave many awards to my colleagues. I am proud of them. But I feel ignored. Never mind, will you have some tea?" 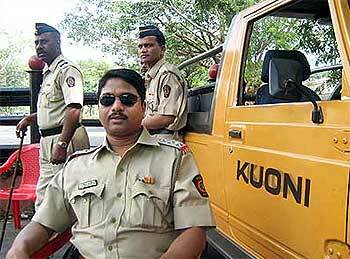 Inspector Bhagwat K Bansode rushed into the Oberoi hotel when he heard about the attacks. "I could hear firing from above and so went up to the first floor." "I could hear noises, but could not see the terrorists. A waiter pointed in the opposite direction. I turned to look. I saw them both. They were wearing blue T-shirts, heavily armed and carrying haversacks." "I moved to my left," Bansode continues. "There was no place to take position. I fired twice. One of them ducked and the other fired in my direction. The bullets ricocheted on the wall behind me. I realised that I could not face their hail of bullets with my one-shot pistol." "Even today I regret that I wasn't carrying a heavier weapon. I had them in my sight and could have killed them easily." He took on automatic weapon-wielding gunmen without a thought, but the government has not given him a thought either. 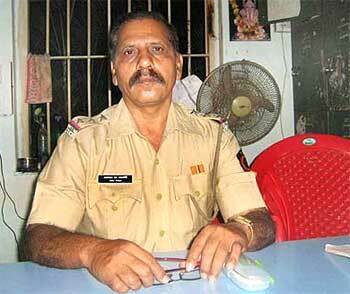 Inspector Bhagwat K Bansode has not received any award, any citation or cash prize from the government. 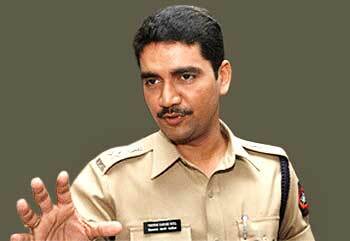 Deputy Commissioner of Police Vishwas Nagre Patil was heading toward south Mumbai when he heard the news. He knew that Anti-Terrorism Squad chief Hemant Karkare, Additional Commissioner of Police Ashok Kamte and Senior Police Inspector Vinod Salaskar were near the CST station. He decided to go to the Taj. It was the most serious attack ever in his jurisdiction. Nagre Patil went into the hotel through the back door followed by his men. The police team, assisted later by DCP Rajwardhan Sinha, Inspector Deepak Dhole and other policemen, prevented the terrorists from coming down from their hideout on the higher floors. Nagre Patil realised that his weapons were not enough to combat the killers. He worked out that the Taj's close circuit television control room, which monitored CCTV cameras placed around the hotel, was the best place to be in to guide the operation. He went to there and instructed his men. The terrorists never knew what hit them. Each time they tried to come down the stairs, they were greeted with a hail of police bullets. In anger they set fire to large parts of the hotel, eventually forcing Nagre Patil and the police team to evacuate their positions several hours later. The DCP was the first senior Indian Police Service officer to enter the hotel. Sadly, most of his men died in the operation. For his bravery that horrific night, he has not received a single word of governmental praise. Nor citations or awards.